Damn the Tweet-pedoes, Full Rupe Ahead! Oh joy — my boss is on Twitter. I guess I have to watch myself now. In fact, News Corp. potentate Rupert Murdoch, who happens to own this Web site (and more! ), just inexplicably joined Twitter. And, like any newbie, he has already had to retract a tweet. Oh, joy, indeed — as I am counting on it. 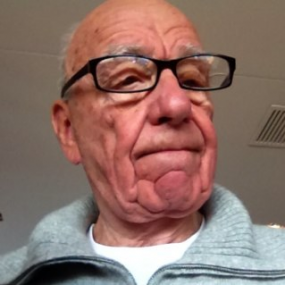 Murdoch, controversies and all, has the kind of socially attuned personality tailor-made for Twitter, even though many point out that he has not been a fan of the Internet and interactive media in the past. While I am no expert on that, that’s actually not been my experience in my encounters with the mogul at many of our D: All Things Digital conferences and elsewhere. In fact, he seems keen on understanding online media, even if it most certainly is not his first language, which has been print. So let’s hope he keeps up the lively patter going forward — unlike many Twitter celebs who trail off after an initial burst of activity — as he pokes and prods the Twitterverse. A place, it should be noted, he once famously said would not make a good investment. Because curious is what Twitter is all about — we can only hope the snaps of his dinners are not far behind. Election night television, it seems, hasn’t changed much in the past four years — the same guys in the same bad suits, pointing at maps, reading wire updates, and trying not to screw up. The biggest difference, I noticed, is how the main tool I really used was Twitter.